Finally!! After “We Run This Vol. 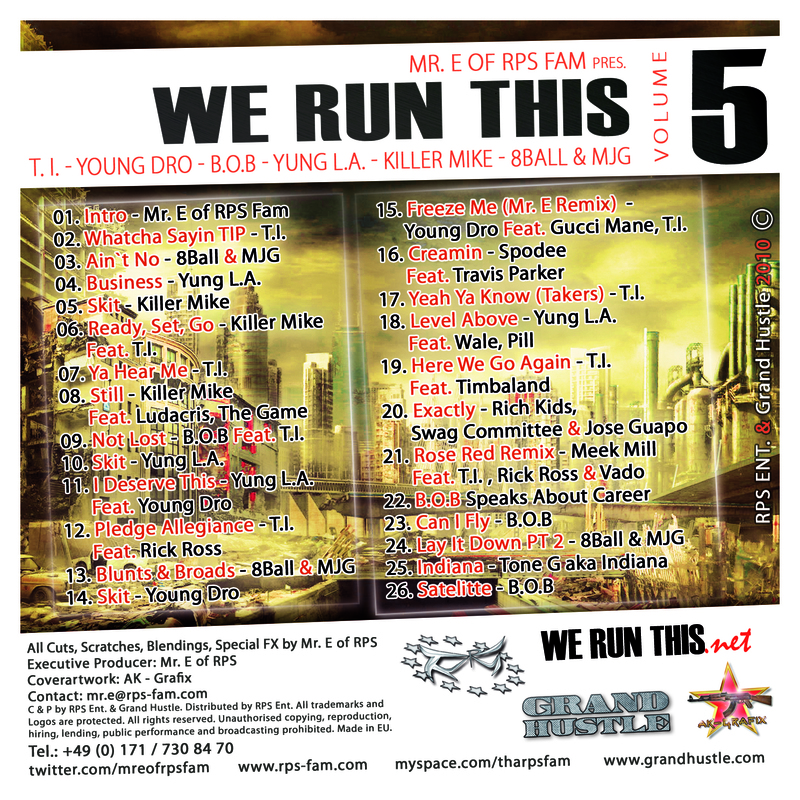 3“, leading Hip-Hop label Grand Hustle and German DJ/Producer Mr. E have finally reconciled and the result is the long awaited “We Run This Vol. 5”. The new compilation comes with 26 tracks, containing just enough roles from the big guns T.I., 8Ball and MJG, Killer Mike, as well as Yung L.A., B.o.B, Rich Kids & Young Dro. The compilation leans toward the South and delievers you with mixes of new, exclusive and unreleased tracks of the Grand Hustle label. 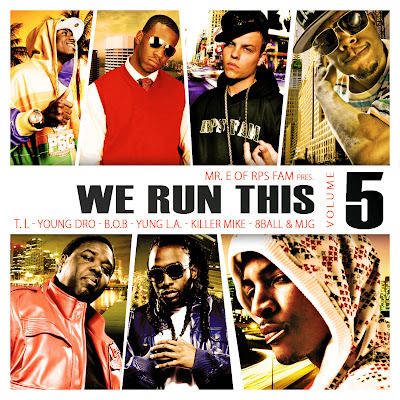 Every song on We Run This Vol. 5 puts a premium on fortitude, energy & Mr. Es aggressive cuts and scratches mesh perfectly with the wordplay of T.I., B.o.B, Yung L.A…. Proving to be a perfect pair, Mr. E from the “RPS Fam” and Grand Hustle definitely will have you lending an ear for this one. And if you refuse, they’ll just take it. 2. Whatcha Sayin Tip — T.I. 4. Business — Yung L.A.
6. 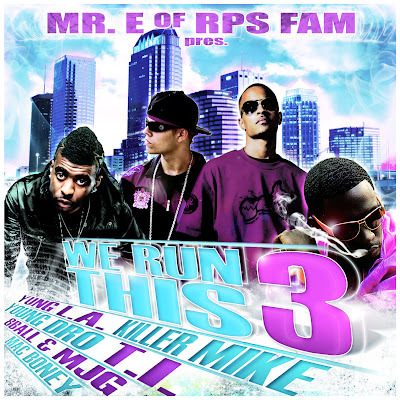 Ready, Set, Go — Killer Mike ft. T.I. 7. Ya Hear Me — T.I. 9. Not Lost — B.o.B ft. T.I. 17. Yeah Ya Know (Takers) — T.I. 2. Whatcha Sayin TIP – T.I.  4. Business – Yung L.A.
7. 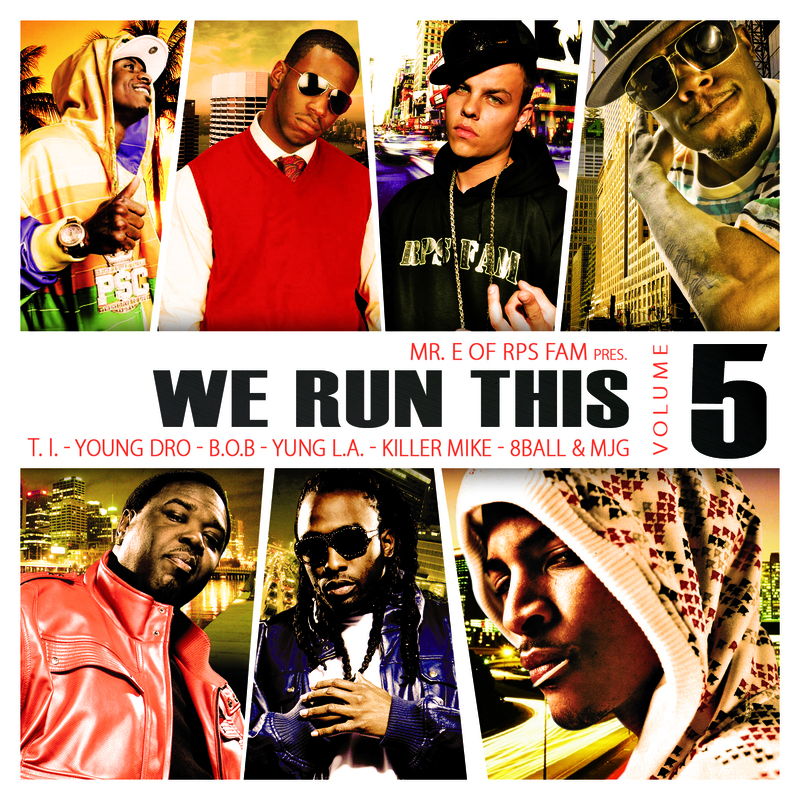 Ya Hear Me – T.I. 9. Not Lost – B.O.B Feat. T.I. 17. Yeah Ya Know (Takers) – T.I. 18. Level Above – Yung L.A. In the Style of “Jackin 4 Beats”: 5 Instrumentals in 1 Joint! We Run This Vol. 3 – In Stores Now! !